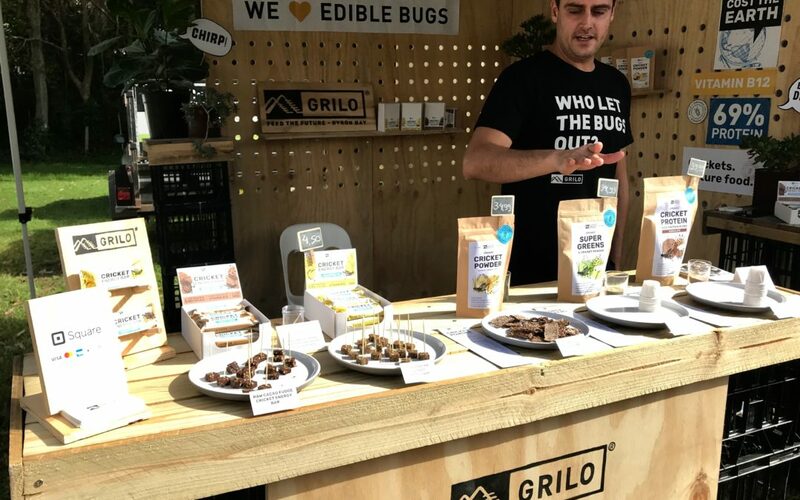 Grilo, which means “cricket” in Portuguese, is a Byron Bay company with the mission to promote better health and sustainable food in an unusual way—through cricket powder and cricket energy bars. Grilo is run by the Brazilian sisters Martina and Camilla Meyer and their partners Lucas Becker and Pedro DaSilva, and they are all mad for edible bugs. They are part of a global food revolution of consuming sustainable protein in the form of crickets. After trying various vegetarian and vegan diets, Martina says the group was searching for a high protein supplement to support their athletic lifestyles. Martina did her research, and discovered crickets have 69% protein content, essential amino acids, as well as B12, iron and calcium. One teaspoon of cricket powder provides the daily requirement of vitamin B12. Martina imported her first bag of cricket protein powder from the US just over three years ago and after one month, she had increased energy levels and was feeling “fantastic”. She says cricket protein is great for general health, supporting metabolism and post workout recovery. She convinced Camilla, Pedro and Lucas to try it and they haven’t looked back since. Pedro and Lucas are both trained chefs and are responsible for product development. The powder they use is imported from the only certified organic cricket farm in the world in Ontario, Canada. The Australian government does not allow the import of live crickets, so it is not possible to farm crickets in Australia at the moment. The team then blends the cricket powder with their own super protein powders, like pea and brown rice protein and chocolate-flavoured protein. The company’s recently launched energy bars come in two flavours—cacao fudge and banoffee pie. Martina says they chose to make energy bars because eating crickets might scare or turn off a lot of people, and an energy bar is a food people are familiar with. It’s an easy platform to introduce crickets into their diet. Martina’s favourite way to eat them is on avocado and toast. “It adds crunch and the flavour is good”, she says. Martina describes the dried whole crickets as very light and crunchy, with a nutty, earthy flavour. She recommends eating the dried crickets seasoned with chilli and salt and accompanied by a beer. At the Sample Food Festival, I tried the crickets in the form of super greens and chocolate protein powder smoothies, cricket crackers and cricket energy bars. The smoothies were creamy and rich, with the super greens providing a slightly earthy undertone. The cricket crackers were crunchy and light, again with a nutty, earthy flavour, and would be perfect to eat as a snack or by themselves or with cheese or a dip. The energy bars were chocolatey and fun; you know the crickets are in there, but there’s not a hint of insect. Martina says many local and interstate restaurants are requesting the whole crickets, particularly Mexican restaurants, to use as a garnish. Grilo products are also sold online and in health food and organic stores in the Northern Rivers region, Brisbane, Gold Coast, Sunshine Coast, Sydney and Melbourne. The full range products, a list of stockists and delicious recipes are available at their website.